Chou Chou! Adventures of a Briard Girl : A Tortoise For Chou Chou Briard? A Tortoise For Chou Chou Briard? Yesterday I got a text from Mary; her law partner found "a turtle" in their parking lot. Would I know what to do with it? I drove right over. It was a small tortoise. His shell was dark brown... until I washed off all the dirt! He must have been hibernating underground, dug himself out, and wandered off on an unseasonally warm day. The parking lot was not a good place for wandering! I once had a tortoise just like this one. So, yes, I knew just what to do. They put a notice on Craigslist, looking for his owner. It's a Mediterranean "Hermanni Hermanni" tortoise, not native to California; obviously he was a pet at some point. He (yes, I see it's a male) looks healthy. I took him home to foster him until the owner showed up. 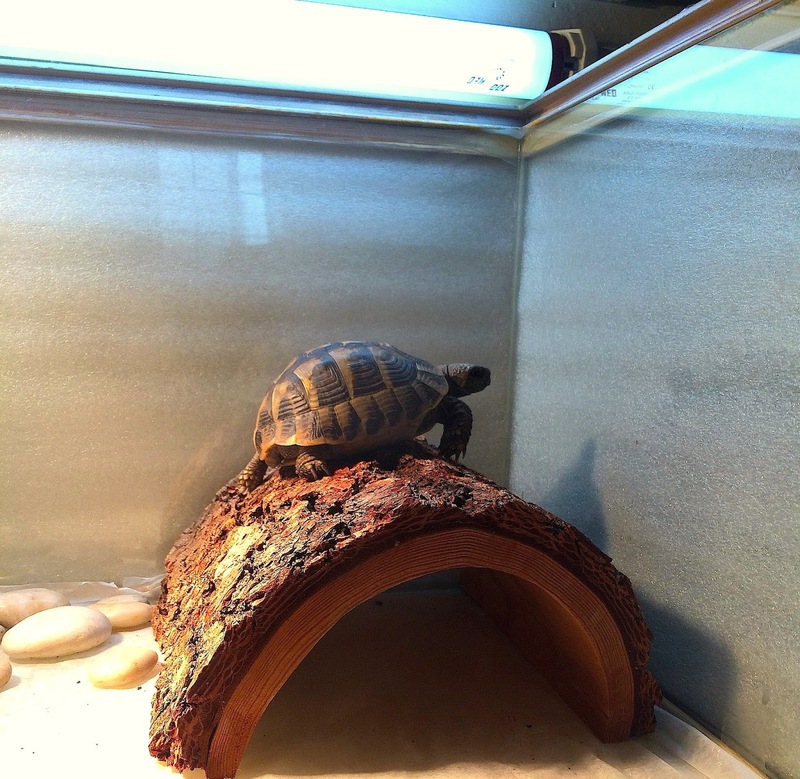 I still had my tortoise terrarium, tortoise UVB, basking and night lights, log, etc., in the garage. I set him on the grass so he could eat some clover if he chose. But it was not warm outside, so he didn't eat. Who knows how long he was wandering around concrete sidewalks and parking lots downtown. He's very lucky that he didn't get crushed or killed by a predator! I took him inside, put him in the terrarium I had and turned on UVB and heat lamps. He ate some lettuce and a dandelion leaf. This little guy is a climber! No word today about the Craigslist notice. No one has claimed him. So I went shopping; he needed food and water bowls, and I wanted to make his environment look more natural. If he stays with me, I will buy a wooden tortoise house. After a really heavy rain last year, Vlad hid a small terrapin in his mouth. We don't know how long on that walk he had it hidden from us. Once it was finally noticed, he had to be forced to, "Drop it!" It wasn't one of Dee's happier moments. Last year, after a heavy rain, Vlad picked up a terrapin somewhere on our walk. No one knew how long he'd had it hidden in his mouth. He had to be forced to "drop it," once it was seen when he moved it around in his mouth to get a better grip. If you REALLY want it gone, Vlad could probably come smuggle it out of your house for you without your pawrent seeing it. His mouth is REALLY big. ("Thanks for writing Vlad! If I need you, I'll give you a bark. Chou Chou's Message: Microchip & Register!